A grand bargain for Alberta? H+K SVP and energy and natural resources national practice lead Mark Cameron contributed a piece to Policy Options discussing Alberta’s energy market following its provincial election. This piece was originally published on the Policy Options website on May 8, 2015. This post was co-written with Dave Sawyer, CEO of EnviroEconomics.org and Development Director of CMC Research Institutes (Carbon Management Canada) Low Carbon Pathways Group. Rachel Notley’s first thought when she realized she had been elected premier must have been that she was dreaming. But her second thought might have been that this was not a dream but a nightmare. She still faces the daunting challenges of low oil prices, deep deficits, and market access for oil and gas mostly stalled. Corporate Alberta has warned her of dire consequences for investment and employment if she revises Alberta’s energy royalty regime and brings in Corporate Income Tax increases and higher Personal Income Tax rates. Oh, and Alberta’s signature carbon pricing policy, the Specified Gas Emissions Regulations (SGER) is scheduled to expire in June. But is there perhaps a way of turning these challenges into an opportunity? We think that there could be if Premier Notley offers to hold off on some of the most contentious elements of the NDP’s platform of concern to the energy sector in exchange for bringing in an improved and transformed carbon pricing policy. Such a move would instantly transform Alberta into a major player in the national and international debate about energy and greenhouse gases. The new Premier would be smart to offer a sort of grand bargain to corporate Alberta – offer to put aside a royalty review for several years until oil prices recover and suspend the proposed corporate and additional personal tax increases in the NDP platform, if they support a significantly intensified carbon pricing policy that would help fill the revenue gap. After all, the oil patch has long been making noises about accepting higher carbon prices and regularly claims that their projects are stress tested against carbon prices of $40 per tonne or more. So Premier Notley can ask them to put their money where their mouth is: don’t implement the tax increases they say they don’t want, if they back her on bringing in the carbon prices they claim they can accept. By redesigning the existing SGER program as a cap and trade system or carbon tax, the NDP could bring in enough revenue to roll back many of the PC budget’s tax and fee increases and not have to raise personal or corporate income taxes further. Intensifying the target would contribute to helping Alberta and Canada meet their 2020 greenhouse gas emissions targets while winning significant market access points at home and abroad. Ms. Notley has said that she doesn’t think the Government of Alberta should be promoting Keystone XL in the United States, but a rigorous greenhouse gas emissions policy that reduced the emissions intensity of Alberta oil could sell the pipeline more effectively than hiring Washington lobbyists or running slick ad campaigns. So what kind of carbon pricing mechanism would be necessary to replace the PC and proposed NDP tax increases? Well, estimates have shown that going to the so-called “40/40” plan for SGER (increasing the greenhouse gas intensity target to 40% while increasing the non-compliance fee to $40) could generate up to $1.4 billion for a technology fund. This could finance significant new investments in energy efficiency and transit while paying for other green elements of the NDP platform without having to raise other taxes. A broad based carbon tax similar to B.C.’s at $30 per tonne covering 70% of Alberta’s greenhouse gas emissions, including transport and buildings, would generate roughly $4.6 billion in revenue annually – more than enough to pay for the NDP platform and bring the budget back into balance without any additional tax increases. Maybe the best approach to keep costs low would be to update the existing SGER regulations to transform them into a cap and trade system that could link up with the Quebec, California, and now Ontario in the Western Climate Initiative (WCI) carbon market. In this case, the SGER price ceiling would need to climb to $20 in preparation for eventual alignment with the WCI. 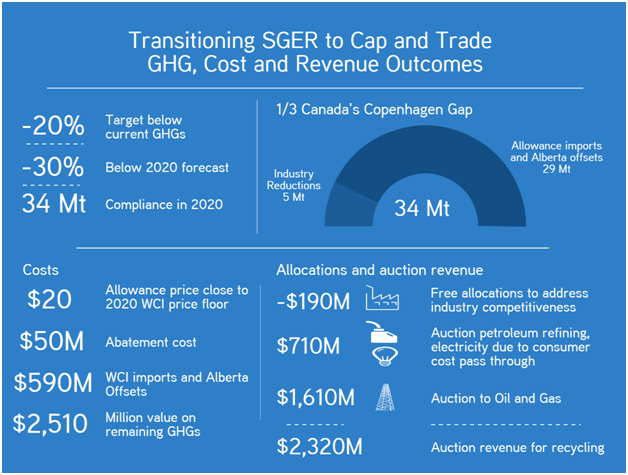 Setting a target to deliver 1/3 of Canada’s Copenhagen target would require 35 Mt of reductions, which would equal compliance of about 30% of SGER covered industrial emissions in 2020. Assuming a similar allocation scheme to the WCI, covered facilities similar to the current SGER and giving some free allocations to address competiveness concerns, auction revenue would be about $2.32 billion annually from the cap and trade system. Compliance costs would be in the order of $640 million, assuming a mix of facility abatement, Alberta offsets and WCI permit imports. With the emission performance of SGER improved, revenue would be available to roll back some of the recent tax and fee increases from Budget 2015 and avoid adding new taxes of their own. The table below shows what would happen to the proposed NDP budget plan if they replaced their planned Corporate and Personal Income Tax increases with a transformed SGER into a WCI style cap and trade. We have assumed $1 billion in revenues from an initial auction in this fiscal year, with full implementation in 2016-17. Not only would these policies plug the holes in Alberta’s fiscal plan, but they would reduce Alberta’s greenhouse gas emissions in 2020, bringing Canada significantly closer to meeting our Copenhagen climate targets. If we were advising Premier Notley, we would seriously recommend going to corporate Alberta and asking for their support for this kind of deal. It would be smart politics and smart policy and would immediately remediate Alberta’s image as a climate laggard. Could good climate policy reduce emissions, roll back tax and fee increases and improve market access for Alberta? Now that would be a dream come true.